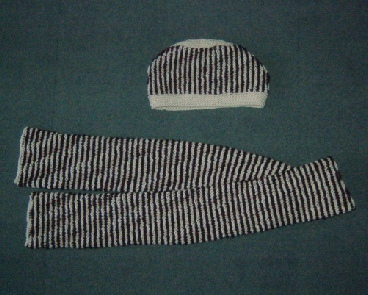 A hat and scarf suitable for men and women. It is hard to draw a line between shadow knitting and illusion knitting. I would say that this falls on the shadow knitting side. 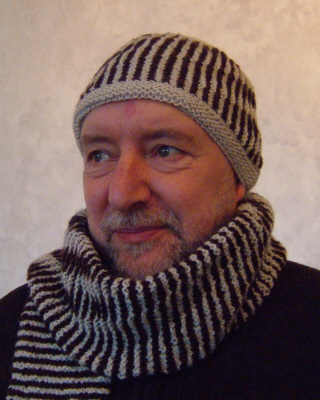 When you look at the hat or scarf from an angle you get the impression of lines spiralling round. I see dark spirals on a light background but that is probably because I used the light colour for the crown and band of the hat and for the back of the scarf. If I had used the dark colour it may have looked like light spirals on a dark background. The hat and scarf have the same very simple shadow design. When you look straight at them you only see stripes in two colours. When you look from an angle you see spiralling lines appearing and disappearing as the person moves around . The crown of the hat can be worked in either of the main colours (or you could use another contrast). 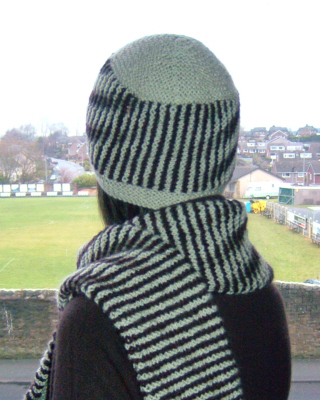 The back of the scarf is also worked plain. 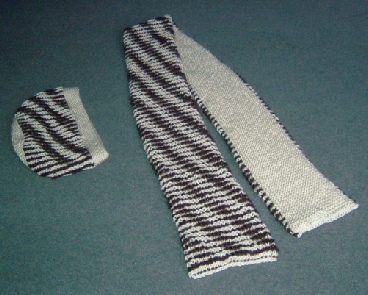 This makes a narrow but warm, double thickness scarf where the spirals disappear round the edge. Mathematically, this is neither a spiral nor a helix. It is merely a series of diagonal lines giving the impression of spirals.